The DLF 2019 Rookie Draft Guide is now available! Our annual dynasty rookie draft guide is back and here to help you prepare for your rookie and startup dynasty drafts. Our draft guide is unlike any other – constantly updated, always improving, with numerous links to both internal and external resources. The DLF 2019 Rookie Draft Guide is your best resource to become the most prepared and knowledgeable coach in all of your dynasty or redraft leagues. The Dynasty League Football team of seasoned analysts provide our own in-house dynasty analysis and resources to help you prepare for your drafts. Hundreds of hours of research, analysis and data collection fuels the DLF Rookie Draft Guide. This alone will give you all the advantage you need in your leagues. But for many of you, we know you still want more. So unlike any other fantasy football site or draft guide out there, we do more. We aggregate links to high quality, free rookie analysis at other sites whom we trust and who’s analysis we consider worth your time. Because we know even more information and perspectives will help shape your understanding and improve your decision making process. Each year we comb through numerous fantasy and NFL websites to provide you with links to consistent, high quality NFL and fantasy football player analysis to complement our already extensive analysis. No-one else does this, because no-one else cares as much about your continued success as we do at DLF. This year, we are proud to provide access to the following additional great resources. Sure, you can go out and hunt down these articles on your own. But because we collect all of this information into one convenient location for you, you can spend your precious time researching and learning, rather than searching for content. The 2019 Rookie Draft Guide is FREE with your DLF Premium Membership! No misleading hidden fees or extra charges. It’s all part of the Premium Membership package. Want just a quick overview of each player? Just read our Pre and Post Draft summaries on each rookie player card to get a quick overview of each player. Get up to speed quickly, stay on top of changes as they happen, and be ready for your draft in record time! Follow the links to our full Rookie Player Profile articles before the draft and the follow up Rookie Player Draft Recaps after the draft. Full, in-depth analysis of every draft-worthy player. Links to the full Rookie Player Profiles and Rookie Draft Recap articles will be added as they are written, so keep checking back for continuing and evolving coverage of the 2019 NFL rookie class. In addition to tons of our own analysis, and our constantly updating rankings, we help you round out your understanding of each player by providing links to some great free resources on other sites. No links to stuff behind paywalls. No links to hot-take or click-bait sites. Just the best analysis from some of the most trusted names in fantasy football and NFL player analysis. No more waiting for a hard copy pdf document to be updated, or relying on analysis that is weeks or months old. The DLF Rookie Draft Guide is constantly updated, always current, with new material and links being added on a near-daily basis! Not just a single write-up about a player. We give you video player profiles, an NFL draft prospect video highlights library, links to news & articles from all around the web, dynasty player news, industry-leading Rankings and ADP, tools like the trade finder and comparison tools, even personalized feedback and assistance with our year-round advice columns and always-available help desk. Every possible resource we can offer you to help you win your dynasty leagues is available with one simple membership. We started doing this way back in 2006, before any other dedicated dynasty fantasy football site existed. Our number one goal is, and always has been, to give you the tools and information you need to be the most informed and prepared owner in your dynasty fantasy football leagues. We’ve been focusing exclusively on dynasty longer than anyone else in the industry. We know what it takes to give you the best chance to win your dynasty league. We work relentlessly to give you every possible edge. The 2019 Rookie Draft Guide is the result of many hours of work by numerous veteran team members, and is of course an outstanding premium resource. You’ll need a DLF Premium Membership to access the 2019 Rookie Draft Guide, but that will give you full access to the Rookie Draft Guide and everything else DLF has to offer. No hidden charges or extra fees. One membership grants you access to everything! We never stop working to help you improve and win. Join the largest and most informed, successful dynasty community on the planet. 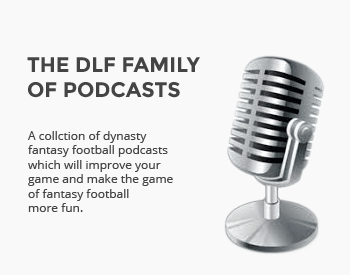 If you are not already, become a DLF Premium Member now! Go to the 2019 DLF Rookie Draft Guide!